A team of researchers with the U.S. Geological Survey and the California Institute of Technology has found that modern earthquake early warning (EEW) systems require those interpreting their messages to take into consideration inherent tradeoffs. In their paper published on the open access site Science Advances, the group describes their study of EEW systems, what they found and offer suggestions regarding how to interpret warnings from such systems. Because no one has figured out a way to predict earthquakes, scientists and public officials have turned to EEWs as a means of offering the public some degree of warning that an earthquake is about to occur. Unfortunately, the science in this area is still weak because earthquakes are so unpredictable. The main problem is that in the first few seconds of an earthquake, there is no indication of how big it will turn out to be. 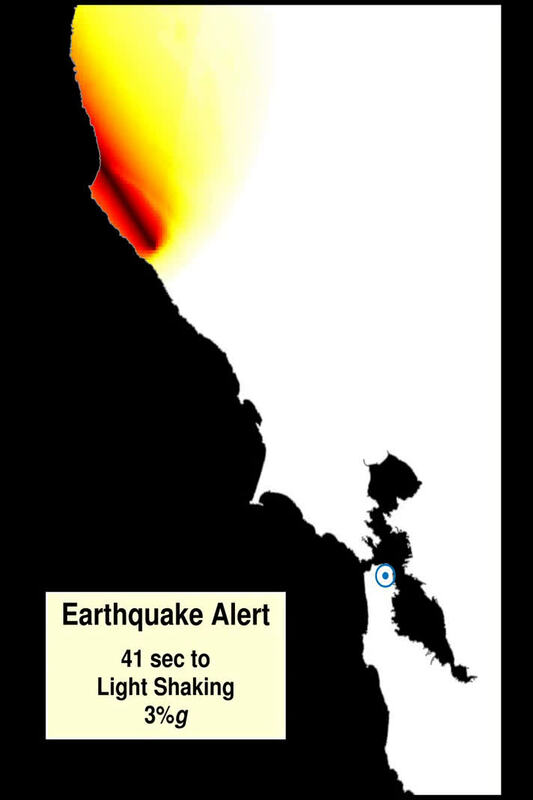 This means that if an EEW sends out an alarm every time it detects a quake, the public will get warnings for quakes they need not fear most of the time. Another consideration is distance—if the epicenter of a quake is right under your feet, there is no EEW that can help you, because it will only tell you what you already know. EEW systems are meant for cases in which the epicenter is some distance from a populated area—if a quake happens 100 miles away, it will take some time for the ground to shake locally. So, how are public officials or the public at large to interpret warnings from such systems? That is what the team with this new effort sought to better understand. To learn more about EEWs, the researchers looked at data from past earthquakes and applied math propagation formulas to calculate how much time EEWs have to issue an alert under different scenarios, and from that, how much time those people receiving such alerts would have to react. They found that in most cases, there is a tradeoff for those attempting to figure out if they should take defensive action or not. 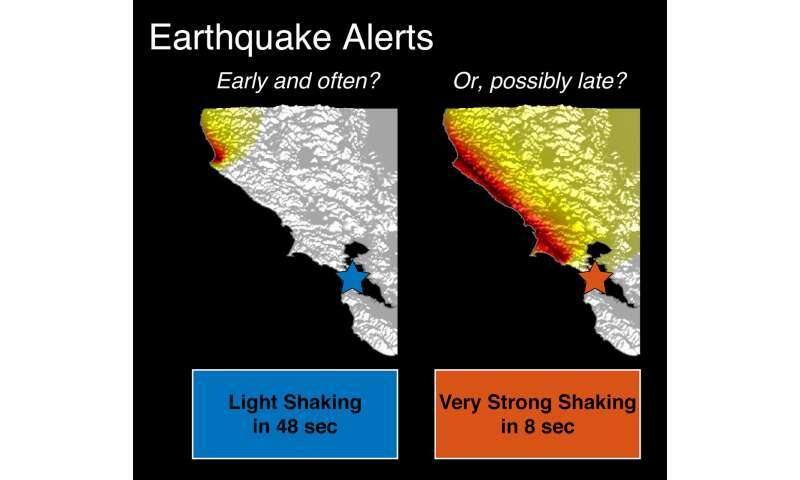 Users can receive alerts with longer or shorter warning times, but the problem is that longer warning times are far less informative—shorter warning times offer a better indicator of how bad an earthquake is going to be, but they offer very little time to do anything about it. The basic physics of earthquakes is such that strong ground motion cannot be expected from an earthquake unless the earthquake itself is very close or has grown to be very large. We use simple seismological relationships to calculate the minimum time that must elapse before such ground motion can be expected at a distance from the earthquake, assuming that the earthquake magnitude is not predictable. Earthquake early warning (EEW) systems are in operation or development for many regions around the world, with the goal of providing enough warning of incoming ground shaking to allow people and automated systems to take protective actions to mitigate losses. However, the question of how much warning time is physically possible for specified levels of ground motion has not been addressed. We consider a zero-latency EEW system to determine possible warning times a user could receive in an ideal case. In this case, the only limitation on warning time is the time required for the earthquake to evolve and the time for strong ground motion to arrive at a user's location. We find that users who wish to be alerted at lower ground motion thresholds will receive more robust warnings with longer average warning times than users who receive warnings for higher ground motion thresholds. EEW systems have the greatest potential benefit for users willing to take action at relatively low ground motion thresholds, whereas users who set relatively high thresholds for taking action are less likely to receive timely and actionable information. The accuracy of quake predictions can be greatly increased by acknowledging the electromagnetic precursors associated with them. Seems like the system itself should put out as much info as possible and let the recipients of the information select the level of sensitivity. For example, if an elevator stops at the next floor and opens its doors for 60 seconds for something that turns out to be really minor; not a big deal. Individuals can make up their own minds. I'm less sure about what broadcast stations should do. The situation that scares me would be to be driving and have a mix of drivers responding to the alert in various ways while others are oblivious.